He had the same reaction when we saw Cats in New York a few years prior. Of course, I also remember my 11 year-old brain blown away by that mammoth, anthem-heavy score and epic storytelling. I mean, my musical theatre experience to this point was Cats and Phantom — shows not really known for gripping narrative. In my late teens, I visited the barricade again in London and was lucky enough to catch the original Eponine, Frances Ruffelle, who just happened to be revisiting her role for a few months. Then, a few years ago, I caught the new national tour, which eliminated the original John Napier sets (including the iconic turntable), creating, surprisingly, an even more cinematic, tightly focused production. So, Miz and I are tight. And now the film. I could write pages on my thoughts, but I want to focus on this topic: is it ok to cast actors who are passable singers in this film? In my opinion, no. No it’s not okay. Now, don’t get me wrong. I’m grateful for this movie release, and I applaud director Tom Hooper requiring the cast to sing live on camera, with seemingly little-to-no “sweetening” of the vocals. This was the right choice for a nearly entirely sung-through show that demands honesty and soul-bearing. Watching three hours of actors lip-synching to their own vocals would have been not only detrimental to the piece, but mind-numbing. And in the film, the value placed on acting and singing is unequally placed, if placed at all. At the risk of flogging an already dead horse, let’s talk about Mr. Crowe. Many have been harsh on his performance, including myself. To his credit, he acts part well … until he opens his mouth to do what I imagine he considers “singing.” At those points, which are pretty much his entire screentime, he goes wooden and looks like a gun is pointed at his back. Furthermore, the score has been lowered at points (the final note in “Javert’s Suicide,” anyone? Oh, and spoilers). Crowe aside, perhaps the biggest offender is Amanda Seyfried as Cosette. I’ll just say this: that performance wouldn’t pass in a third-rate community theater production. Absolutely wretched. 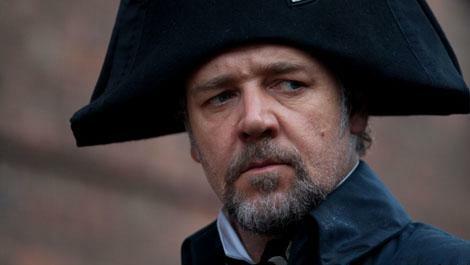 Javert should have halted his hunt on 24601 and arrested his daughter for eardrum assault. Ok, I’m being a bit harsh. I was actually quite moved by her performance, and, let’s face it, it’s already pretty heavy-handed material, especially considering that they (smartly) moved the song to after poor Fantine’s been prostituting herself. In the theatre, Fantine sings the song as she faces her certain demise — here, she’s already rock bottom. Not to mention Hooper has placed Hathaway in a literal coffin as she begins the number. As a result, her performance was broader than anything I’ve seen on stage. I guess what I’m trying to say is I felt smacked in the face with an Oscar Performance rather than provided with an honest moment. But, on the flipside, we have Eddie Redmayne (Marius) and Samantha Barks (Eponine), who are each excellent in their roles — singing and acting with nuance and great skill, perfectly augmenting their performances for film. And, guess what? Neither one are stars and both have significant stage experience. Now, for Mr. Jackman, an actor with solid musical stage experience and a Hollywood name — a rare breed, indeed. I know I’m in the minority here, but I’m just not a fan of his singing voice. There’s a nasal quality that makes him sound like a 1920s on-air announcer. And all those affectations assaulted my eardrums during his strangely belted “Bring Him Home,” a song that I feel is best delivered as a quiet meditation — a prayer. All that said, as far as Hollywood actors go, Jackman is the ideal choice for this mammoth role — probably one of the biggest in modern musical theatre (right up there with Sweeney Todd). I realize I sound like the film offended my sensibilities. Aside from some significant reservations, I did, in fact, enjoy the movie. I’m just, frankly, annoyed with the general public’s acceptance of fame over talent when it comes to movie musicals. Certainly this is the sacrifice when you create a musical movie. You need to stock it up with stars to sell tickets. And the number of Hollywood stars that are excellent singers are few. I know this. But I don’t have to accept it. Maybe Trey Songz should have played Javert? And considering Broadway musicals are now just vomiting out hit movies with jukebox scores, we’re all in trouble.